A friend messaged me the other day wondering if I was aware of a new Bonhoeffer bio about to be released. I was given hope about this biography by Charles Marsh by the fact that at least the cover has a picture of Bonhoeffer smiling. I know, don’t judge a book by its cover. But the common pictures of Bonhoeffer are so dour, including the one on the cover of the Metaxas bio, that they make me NOT want to get to know the guy. 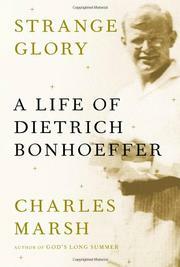 Though Eric Metaxas’ Bonhoeffer (2010) is a more sensitive and well-written account of the subject’s life, Marsh also serves readers well. There is much in the Metaxas biography that makes it a useful resource. But I continue to be mystified by those who say it is ‘well-written’. Well researched? Check. Well documented? Check. Thorough? Check. Successfully reclaims Bonhoeffer for a more orthodox Christianity? Check. Well written? No. The publisher sponsored blurbs on Amazon praise the writing of the Marsh bio. But so do many who praised the one by Metaxas. So, I’m jaded. The big question for me will be this: do I have sufficient interest in Bonhoeffer to slog through another 500 page bio on his life? At present, no. Knowing there is a well told story between the covers of this book could push me to read it. I wait to hear from others if this is so. In the meantime, maybe I should just read, well, Bonhoeffer. Now there’s an idea.